With Spring Celebrations comes the gathering together with family and friends. This usually means making sweet treats! These Strawberry Cheesecake Brownies are a nice twist on traditional brownies, with it's rich chocolate brownie bottom, a light strawberry cheesecake like middle and then topped with a chocolate glaze and cute spring candy sprinkles, Sure to be a crowd pleaser at any gathering you bring it to! It's #SpringSweetsWeek and time to celebrate those spring treats. Don't forget to checkout all the recipes and the giveaway at the bottom of the post. Sponsor Shoutout: We have great sponsors for Spring Sweets Week! For today's recipe I used 3 great sponsors to create this recipe! Adam's Extract: They provided me with their Adams Best, Vanilla, Lemon Extract and my favorite: Their all natural food coloring, to be used in recipes this week. Today I used Adams Best Vanilla and their all natural food coloring in today's recipe. I love their Vanilla, and their all natural food coloring. My daughter cannot consume synthetic red food dye, and when we first found Adams natural food coloring it changed everything in our baking! I just trust Adams Extract! Nancy's Yogurt: Is a company with a simply motto: local milk, real ingredients, and live cultures- all crafted with care, from our family to yours. They provided me with free products for recipe development. I used their cream cheese. They also have yogurts, cottage cheese, and sour cream products. I love that they are loaded with probiotics too! Sprinkle Pop: Has THE cutest and most varied and tempting line of candy sprinkles hands down! I just have the hardest time choosing which ones to choose from everytime I shop with them!! Today I am using their Sprinkles called CottonTail Confetti. but I also picked up a packet of their Green Tea Sprinkle Mix which has a wonderful blend of spring colors in just a beautiful hue! It’s simple: local milk, real ingredients, and live cultures—all crafted with care, from our family to yours. These Strawberry Cheesecake Brownies are a nice twist on traditional brownies, with it's rich chocolate brownie bottom, a light strawberry cheesecake like middle and then topped with a chocolate glaze and cute spring candy sprinkles, Sure to be a crowd pleaser at any gathering you bring it to! Generously grease a 9 inch square pan. Line pan with parchment paper or foil leaving an overhang to help lift the brownies out of the pan. If using foil, generously spray the foil. In a medium bowl mix together all of the brownie ingredients according to package directions. once mixed, spread evenly into prepared pan. In a mixing bowl, cream the cream cheese on medium speed until it's fluffy. Add the condensed milk, constarch, jam , egg, vanilla, and food coloring , blend well. Pour the cream cheese mixture on top of the brownie layer. Place the pan on the lower rack of the oven. bake for 40 minute or until set. the top should be mainly pink but is ok if the edges are browned a little. Remove from oven, and cool on wire rack till it reaches room temperature. Cover with plastic wrap and place in refrigerator for at least 30 minutes , overnight is best. melt the chocolate and butter in the microwave or in a double broiler. Once mixed and smooth, spread over the top of the strawberry cheese cake layer, be sure to work quickly , since the brownies were chilled the chocolate will set quickly. If using any candy sprinkles, sprinkle them on top of chocolate topping before it sets up. Once it sets, use the paper or foil overhang flaps to carefully lift from pan and place on cutting board. peel back lining, and carefully cut into small squares or rectangles. Serve at room temperature, but store leftovers in the refrigerator. Now here is more #SpringSweetsWeek Recipes! and don't forget to check out the prize packages and enter the giveaway below! You have my mouth watering just thinking about it. They look so good! Oh my goodness I love the flavor of raspberry and chocolate together. The color of these brownies is so pretty. Strawberry Cheesecake brownies! What a great idea and I love the sprinkles! These bars sound absolutely scrumptious! Brownies, cheesecake, and strawberries - that's a winner in my book! Oh wow. I'm a total strawberry and chocolate person and these are scream BAKE ME! BAKE ME NOW! I must oblige. I love every single thing about these brownies. Strawberry, cheesecake, and chocolate. Yep. Wow, that strawberry cheesecake layer sounds amazing! I love strawberry and chocolate together. I can't wait to try these - they sound right up my alley! 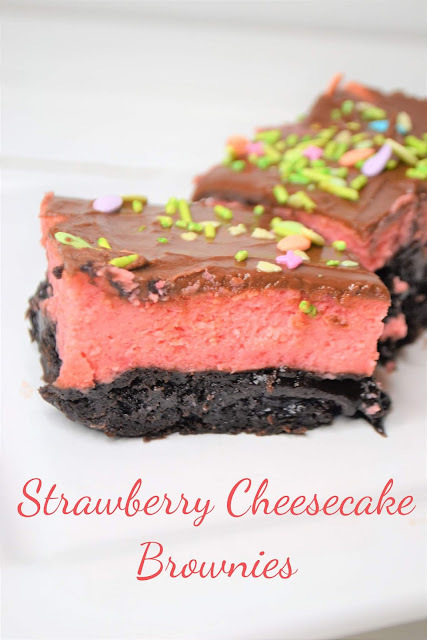 Strawberry, chocolate and cheesecake all in one bite....be still my heart. These look amazing. I love chocolate and strawberry together! These are so colorful and decadent looking. I love the flavor combo! One of my all time favorite treats is chocolate dipped strawberries. I can just imagine how good these brownies are.